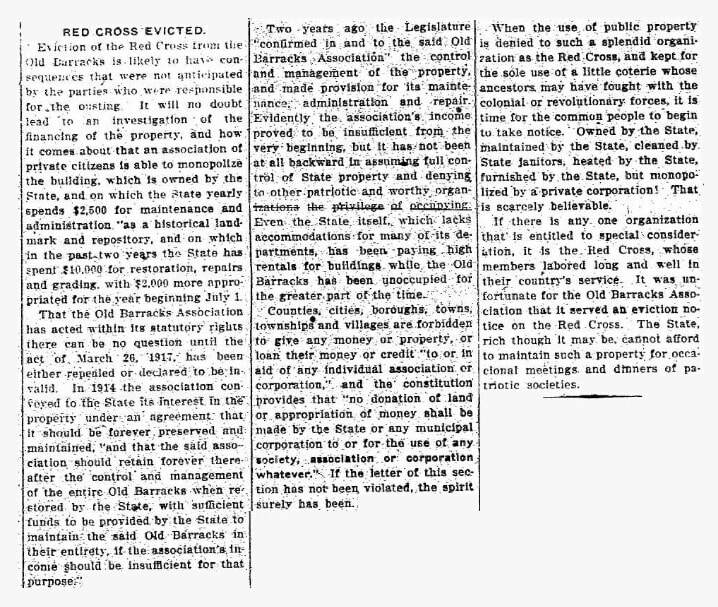 An incendiary news piece revisited and reinvigorated tensions about the Red Cross' use of the Old Barracks. 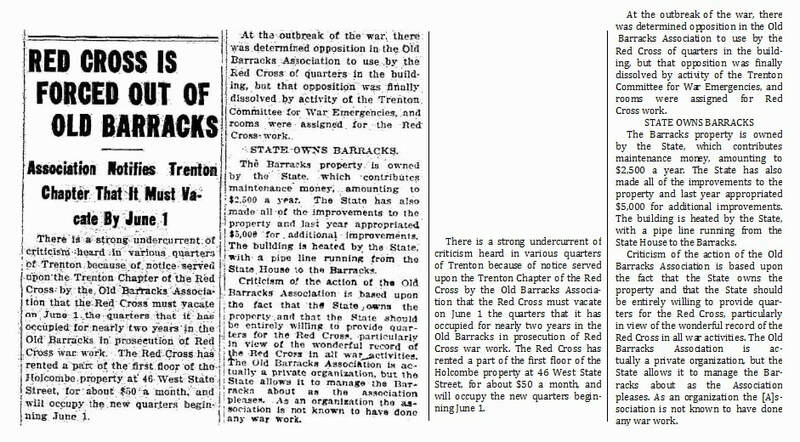 The May 27, 1919 piece ‘Red Cross is Forced Out of Barracks’ incorrectly highlighted the Association’s reticence to let the Red Cross use the site in the first place. Trenton Evening Times, May 27, 1919. 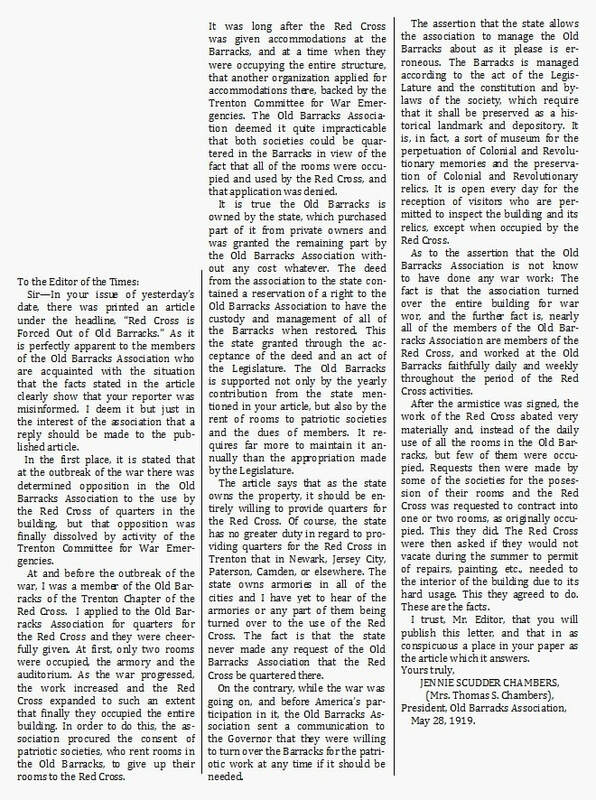 Despite the article's claims, the original meeting minutes demonstrate that the OBA voluntarily offered the Barracks as quarters for the Red Cross. Moreover, many Association members actively served in the Trenton Chapter of the Red Cross. 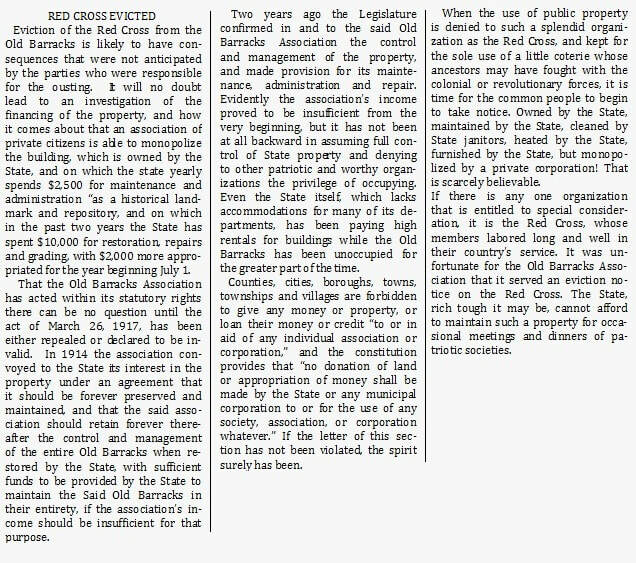 The next day, the paper published an opinion piece entitled ‘Red Cross Evicted’, which called out the Association for muddying the lines between their status as a private organization and the public standing of the state-owned Barracks building. Trenton Evening Times, May 28, 1919. Finally, on May 29th, Old Barracks Association president Jennie Scudder Chambers wrote to the editor of the Trenton Evening Times and explained the Barracks’ position in the tumult. 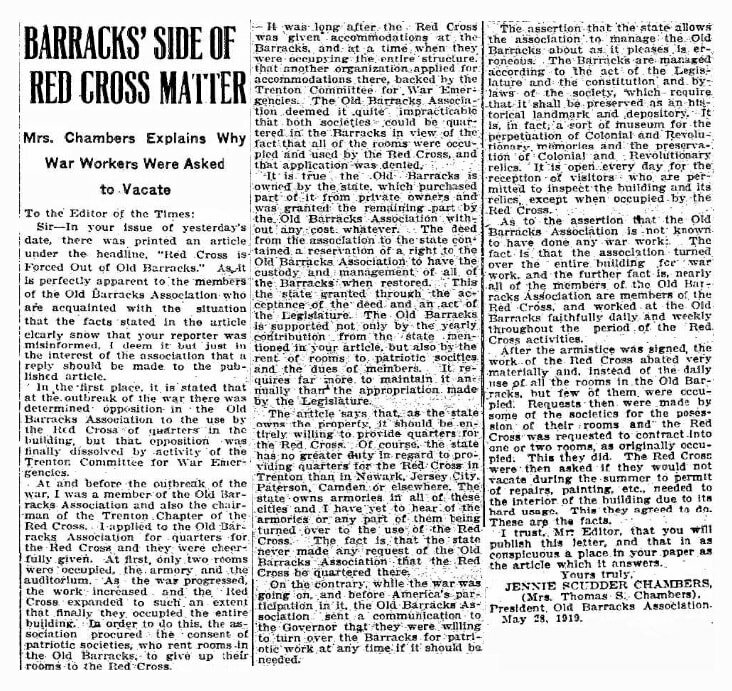 Jennie Chambers’ rebuttal to the defamatory articles dispelled any notion of “determined opposition” and settled the issue of the Red Cross’ departure from the Barracks. Old Barracks Association meeting minutes, October 8, 1919. Archives of Old Barracks Association. With that notation, the Red Cross’ stay at the Old Barracks concluded. However, the support the Association demonstrated during the war was remembered and honored by the American Red Cross in 1926, when the Trenton Red Cross chapter hosted the Red Cross Regional Conference for New Jersey chapters at the Old Barracks.